Star Wars The Force Unleashed was a mediocre action game that sold like gangbusters anyway, so it's only natural LucasArts would announce a sequel, oh-so-cleverly dubbed Star Wars The Force Unleashed 2. 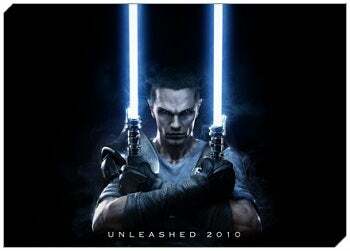 With Star Wars: The Force Unleashed II, the epic story continues as players once again assume the role of the devastatingly powerful Starkiller - Darth Vader's secret apprentice set during the largely unexplored era between Star Wars: Episode III Revenge of the Sith and Star Wars: Episode IV A New Hope. Question is, how excited are you really to play a guy code-named 'Starkiller' twice? The original was a pretty mess: Too short, too easy (except for the wretchedly bad star destroyer level--how'd that ever pass QA? ), too developmentally predictable story-wise, and far too moony-eyed about its gee-whiz physics technology, which, however cool, was never going to compensate for the silliness of a guy who manipulates The Force like some vengeful demigod in a hack D&D story. Here's my read. LucasArts wanted to better link the first and second Star Wars trilogies by exploring the resentful relationship between Darth Vader and his varicose-veined boss, Palpatine. Their solution: Give Vader an apprentice who hunts Jedi on backwater planets and space stations as training grist for a joint coup d'etat, then make that apprentice able to pretty much tear apart the environment with his mind. Trouble was, the game's "grab" interface, used to interact with said environment, was dismally vague. To target something, you had to "aim" the camera without a reticule guide. It was tricky enough just zeroing on simple rocks or bits of debris to fling at opponents, but disastrously imprecise when enemies and objects crowded your view. Sometimes you'd reach for an object in a pinch and come up with nothing, or try to grab some stormtrooper behind a cannon and wind up snagging something else entirely. The game's later levels were especially vexing, the one mentioned above in particular, where you're supposed to pull down a star destroyer while fending off waves of tie fighters. Grabbing the star destroyer and getting it to budge was hard enough, but zapping relentless squadrons of tie fighters that swooped at intervals without a target-feedback system was like playing pin the tail on the (flying) donkey. If I were LucasArts, I'd key the whole affair down, pull together a more deterministic targeting system, steer clear of star destroyers (or other large ships) as wrestling opponents on pain of death, and hire some decent writers to draft a story that drives the gameplay for a change, instead of the other way around.